This morning was the Fall Tri Team's Practice Tri, for their upcoming event at Treasure Island, so the Ironteam was there to volunteer and help with the proceedings. I stood on the shore thinking, I'm glad I'm not going that what water, just supporting events rocks! Once the Tri team were all out of the water and on to their ride, it was time to get the Ironteam Captain's Ride started, which I was leading. 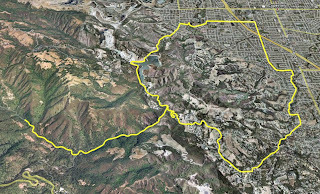 It was a short loop over Mount Eden, with a out and back on Steven's Creek Canyon Road. Although a simple loop there were a surprising number of turns to navigate through the neighborhoods of Saratoga (yes, next time I'll be printing maps). Luckily the group managed to stay together well and there was no major disappearances on the ride. Following the ride there was a twenty minute run just get those legs use to pounding on the ground again. Afterwards we joined the Tri team for a BBQ, while one of our Honorees Doug Booth talked about his experiences with Lymphoma.